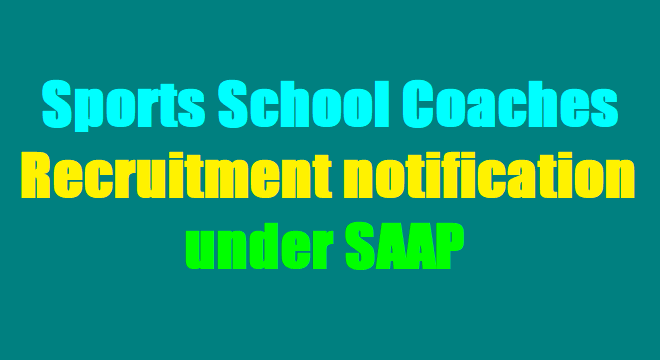 SAAP Coaches Recruitment for Hakeempet Sports School(Sports School Coaches Selections) 2017: Recruitment of coaches for SAAP, Hakeempet Sports School Coaches Recruitment, Hakeempet Sports School Coaches Selection: Sports Authority of Andhra Pradesh (SAAP) Recruitment of Coaches - SSAP Coaches Recruitment 2017: Sports Authority of Andhra Pradesh is an Apex body for Promotion of Sports in the state. SAAP is implementing the Sports development programs, Schemes of Govt. of India / SAI, besides Construction / Maintenance of Stadium, Establishment / Sports Authority of India. SAAP is in pursuit of recruiting qualified coaches on outsourcing basis to work in various locations across the state of Andhra Pradesh. Final interview: Will be on ................2017 for S.No:l to 9 disciplines, ..........for S.No.10 to 18 disciplines and ........... for S.No.19 to26 disciplines at SAAP Head office, Vijayawada. 1).The SAAP committee is the final authority for the selection of coaches. 2).The candidates shall attend the interview with all original certificates without fail. 3).The performance of the coach will be reviewed every year and based on the performance the service will be extended. 4).Upper age limit shall be relaxed for exceptionally talented candidates. Sports in Andhra Pradesh has its own importance, where many sporting personalities were into limelight. The Sports Authority of Andhra Pradesh (SAAP) undertakes the sports development activities such as construction of Stadiums, establishment of sports academies and other sporting related activities. The Sports infrastructure have increased tremendously like improving infrastructure in outdoor and Indoor Stadiums, play fields, sports academies, sports equipments etc. Sports like kho kho, kabaddi are played mostly in Andhra Pradesh.